Integrating data, models and technologies with no user interaction. Contemporary fire behavior software tools required a high degree of specialization, training and effort in the preparation and conversion of input GIS data to actually use the software. When time is of the essence, this limits the utility of these programs, especially for initial attack and real-time suppression activities. Wildfire Analyst was specifically designed to address this issue, providing analysis capabilities for a range of situations and users, with minimal knowledge of GIS data required. Wildfire Analyst provides seamless integration with Esri’s ArcGIS with no conversion or pre-processing required. The mechanical steps in preparing data, common to other programs, is eliminated. This greatly increases usability, allowing users to concentrate on interpreting simulation outputs, and making important decisions about how and where to deploy firefighting resources. Provides seamless integration with Technosylva’s enterprise incident management system, fiResponse. 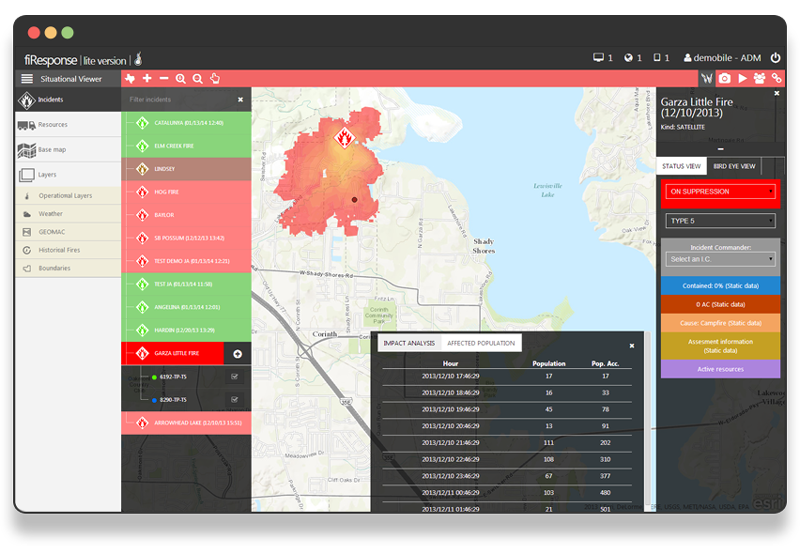 Wildfire Analyst is a software component of Technosylva’s incident management software suite, providing seamless integration with our fiResponse™ platform, to provide real time information about where a fire is likely to spread and what potential impacts may be – in seconds. Seamless integration with out fiResponse software provides critical information to support dispatching and resource management activities. fiResponse™ Web showing WFA simulations created automatically for each active incident. fiResponse™ is an enterprise wide decision support system that provides capabilities for managing wildland fire incidents and all associated operational activities related to incident response, dispatching, resource management, and resource tracking. fiResponse™ is designed to support the entire lifecycle of an incident supporting multi-agency use with seamless synchronization and sharing of data between different users, agencies, and devices for tracking incidents – all on a GIS platform! 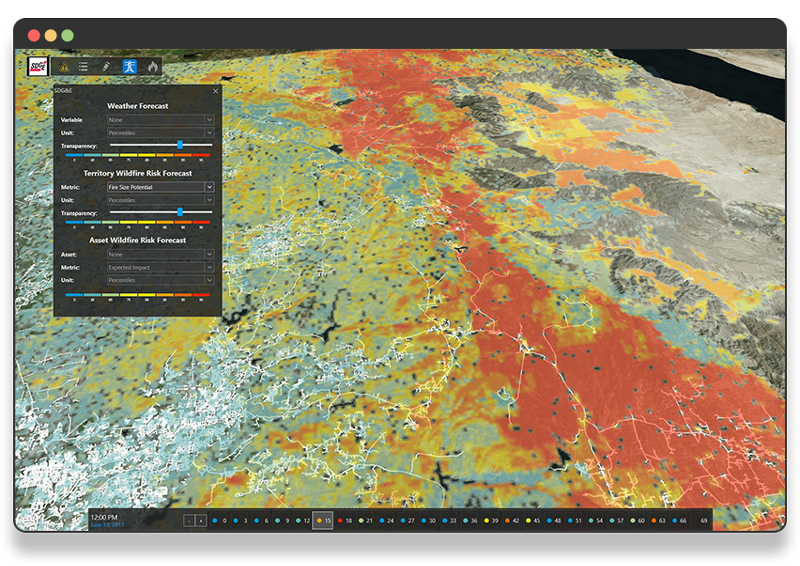 Cloud-based subscription for wildfire risk forecasting and real-time simulation analysis. Wildfire Analyst Enterprise provides capabilities to integrate the full range of modeling capabilities into custom applications on any desired platform – including mobile apps. This is ideal for using custom or proprietary data and deriving custom outputs tailored to a specific customer need. Wildfire Analyst Enterprise is ideal for use in the electric utility, finance and insurance industries where providing real-time results, by integrating proprietary data, is essential to meet the unique needs of companies and their customers. Custom integration showing wildfire impacts. Proprietary weather integration for risk forecasting. 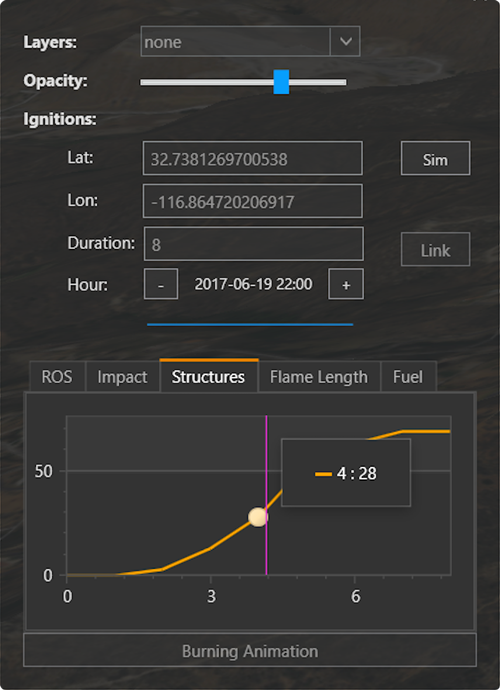 Using Wildfire Analyst Enterprise’s timeline feature provides a 4-D operating environment for reviewing modeling outputs and risk forecasts. Users can quickly view temporal outputs with visual cues that indicate when fire behavior potential and impacts are worse for the forecast period. This allows users to focus on timeframes and areas of most concern. The forecast timeline shows a 72 hour prediction horizon with colors to indicate the worse fire weather and potential impact times. Millions of wildfire simulations can be generated using forecasted weather data to provide a real-time risk assessment of resources and assets across large landscapes. 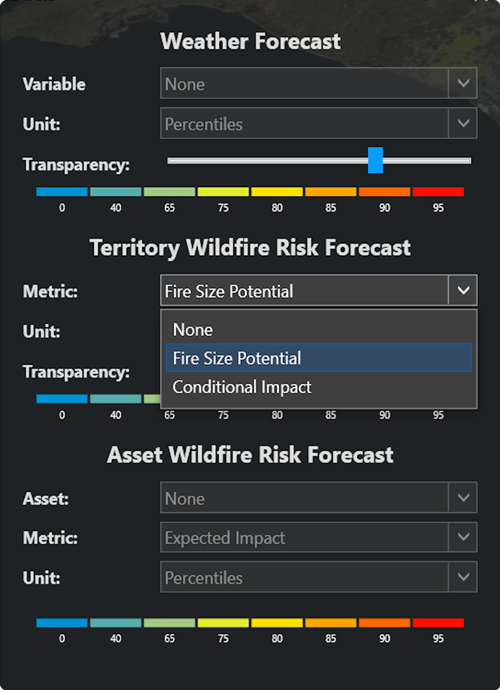 Unlike other static wildfire risk assessments, employing the Wildfire Analyst API, provides the ability to model wildfire risk and impact potential on an hourly basis. This is only possible due to the advanced capabilities and modeling performance of the software. Wildfire Analyst Enterprise changes the paradigm of risk assessment. Daily wildfire risk forecasting is now a reality with Wildfire Analyst Enterprise.